There were many things fans were looking forward to seeing this time around at Celebration. From the various tributes to our Princess, Carrie Fisher, to the hopes of the first trailer for The Last Jedi. Although nothing could've surprised them more than what was to come from the start of the entire convention at the 40th Anniversary Panel. Everyone knew this was going to be something they didn't want to miss as they started lining up Wednesday morning outside the convention center. Their faces determined with hopes of getting a wristband which would gain them access to the Galaxy Stage where the main event would be broadcasting live from. Though they were running on almost no sleep, the fans poured in and found their seats, not to sit in them, but to stand staring at the screen in anticipation. The energy in the room continued escalating as the show got started and our host got ready to introduce our first guest. Kathleen Kennedy took the stage as the cheering begun and lightsabers ignited throughout the crowd. "Your passion, your dedication, and your love of Star Wars...you guys have no idea how that inspires us every single day," Kathleen shared as she reminded us that we the fans are the most important part of what they do. Before the words were even out of her mouth the screams escaped from anticipating fans. There had been rumors, but few dared to hope that they were true. But all disbelief erupted into thunderous applause as the maker himself walked out on stage. George Lucas was there to speak live to all his most dedicated fans. If that wasn't enough, Anthony Daniels, Billy Dee Williams, Peter Mayhew, and Mark Hamil, Warwick Davis, and Dave Filoni joined him on stage. Fans were already ecstatic with the banter and stories pouring out so organically from the reunited cast but then Warwick Davis teased "it doesn't get much more epic than this, or maybe it does." The room exploded like the Death Star, the ground rumbled, and the crowd roared so loud that you couldn't hear yourself scream, because the legendary Harrison Ford walked onto the stage. Ford and Lucas talked about how he got the part of Han Solo, his carpentry work before becoming an actor, and how his love of flying (not landing) helped secure him the role of many lifetimes. 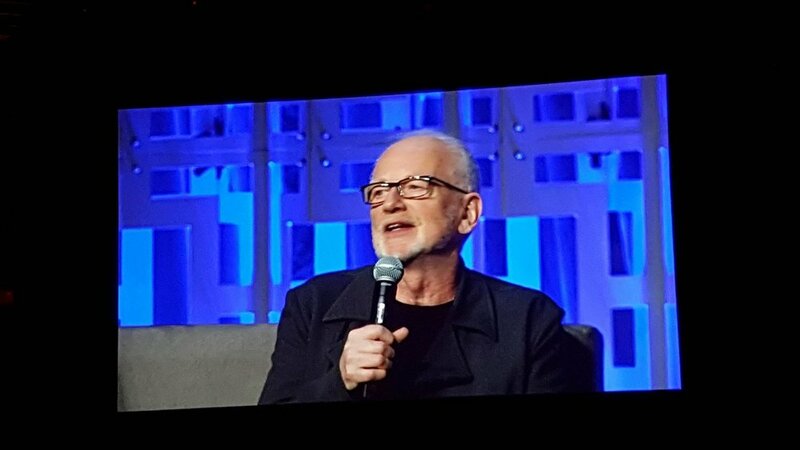 Ian McDiarmid and Hayden Christensen were added to the stage and the crowd hung on every word. Warwick said it right, "we can't celebrate 40 years of Star Wars without remembering our beloved princess." The tribute to Carrie Fisher. As the memories played for us on the screen, every soul in the room was aching as throats got tighter and eyes were holding back tears. Billie Lourd did what most wouldn't have the strength to do, but as the daughter of a warrior princess she spoke on stage about her mother's influence, love for her fans, and most of all her love for Star Wars. Lourd told us that her mother used to say that "she never knew where Princess Leia ended and Carrie Fisher began" and then went on to share with us the most important thing her mother taught her. Which was to recite the entire message Princess Leia programmed into R2-D2 when she sent him off to find Obi-Wan. As she recited it flawlessly, standing there in a very Leia-like white dress, the daughter of our favorite Princess made us remember that Carrie had touched us all and would forever be part of our universe. 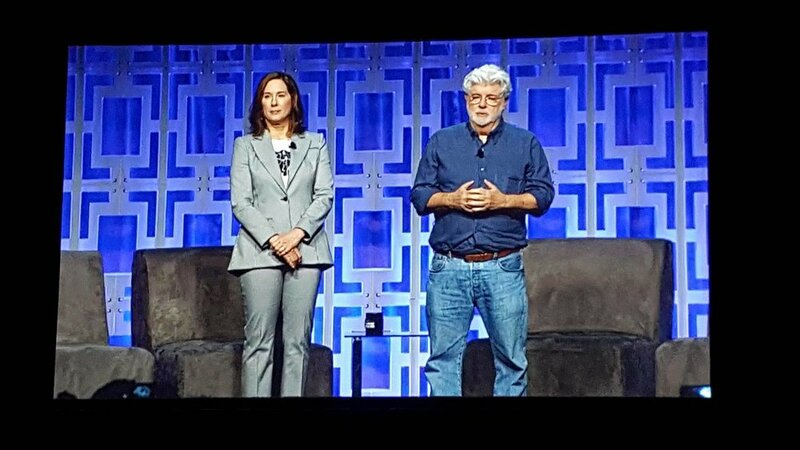 George Lucas and Kathleen Kennedy also paid their respects. As if emotions weren't pushed to their limits enough, the circle became complete as the side stage curtain unexpectedly dropped to the floor revealing the Orlando Symphony Orchestra playing Leia's Theme and was orchestrated by none other than John Williams himself. After everyone gasped in awe, all breathing stopped, and the suspension of disbelief took over as we got lost in the greatest score of all time. As we were transported to a galaxy far, far away, every kind of fan, big or small was tied together by a larger force. A Force that binds us together now and for all time.